Walking into Metro on Saturday night, I was surprised to find it emptier than usual. 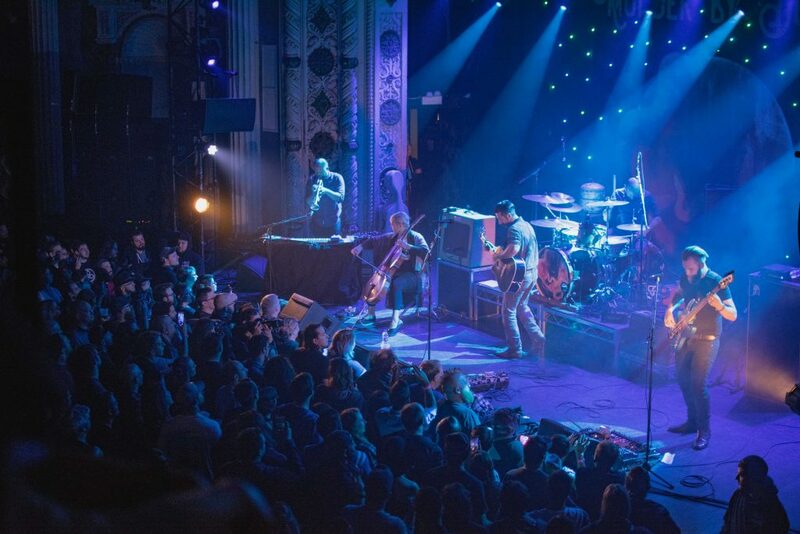 I had arrived two or three songs into the opener’s set—a band called Mutts, but more on that later—and had expected to walk into a sea of bodies. Just as I thought of how happy I was to not have to elbow through the crowd to get good shots of the band, a flood of people began filling every spare inch of space in the venue. I wondered if they had arrived together on some bus (a Scenicruiser, no doubt). 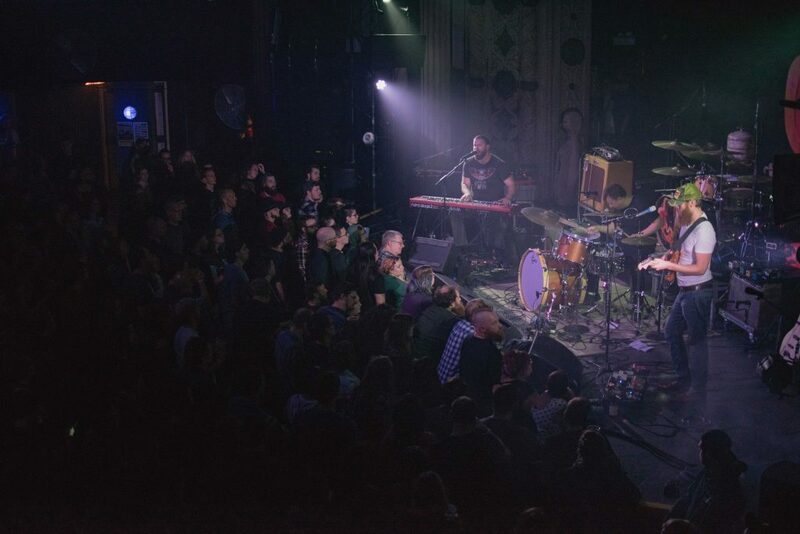 This was Mutts’ last show on tour with Murder by Death, they definitely played like it. Meaning they threw the hell down. 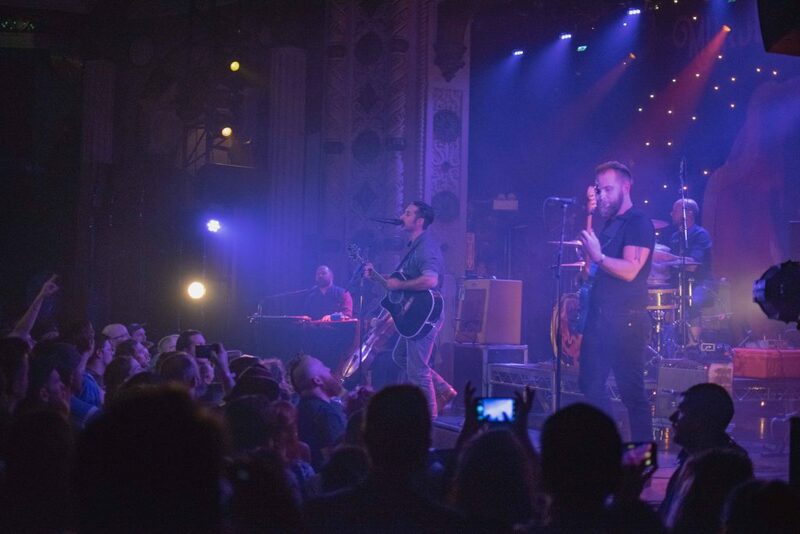 They were a tight, bearded, and sweaty three-piece from Chicago, with one guy on drums, one on bass, and another playing keys and singing. They’re a self-labled American-rock band, with a sound somewhat similar to a Louis Armstrong/Tom Waits/Black Keys mashup, with flecks of Steely Dan and Zeppelin. They played mostly dark, spooky songs with deep, mumbly vocals, jazzy bass lines, and epic, swelly keys. I got a Tim Burton, Nightmare Before Christmas vibe, which paired well with their active stage presence. The drummer was an animal, and the front-man was all over the place, belting out their songs and even standing on his keyboard for a hot second. After a successful set, they thanked MbD for having them on tour, and made way for the main attraction. 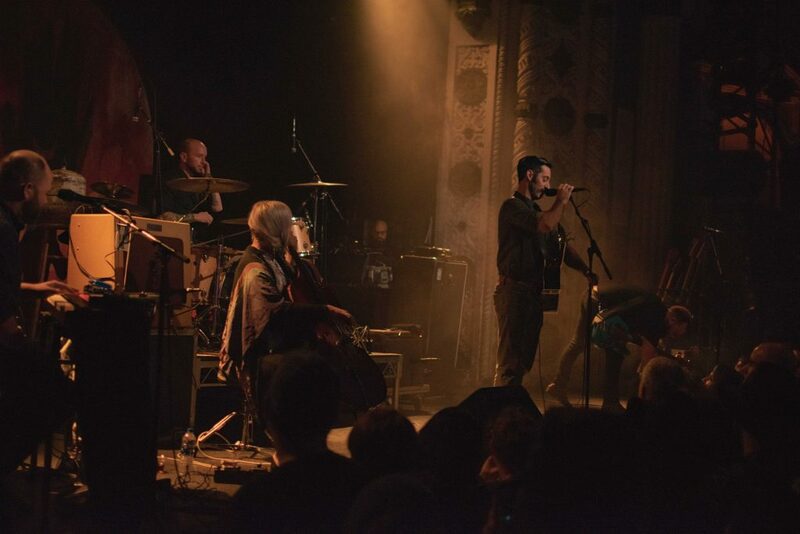 After a quick intermission and some shuffling around on stage, the members of Murder by Death were greeted by a very friendly crowd—they clearly have a huge Chicagoan following. 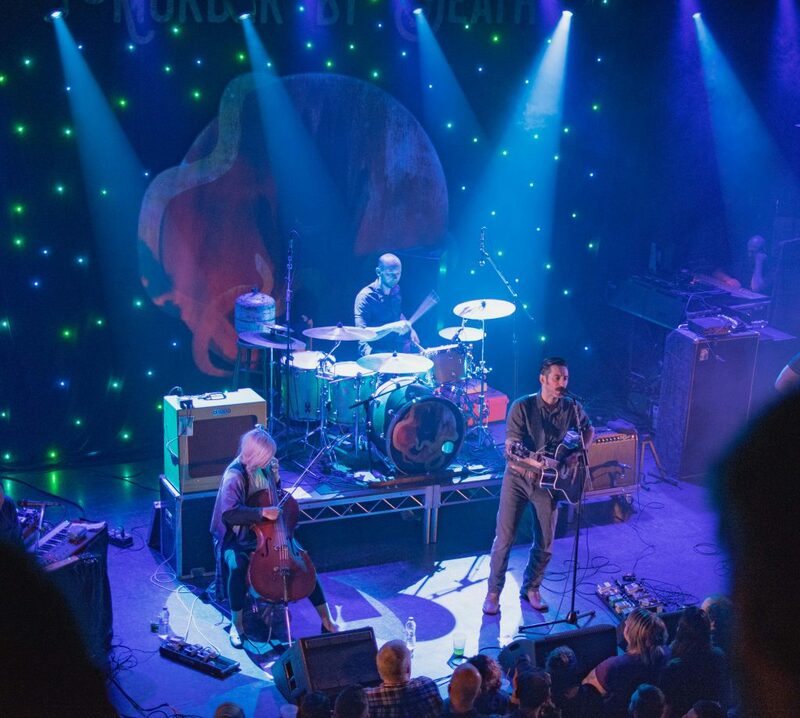 For the unfamiliar reader, Murder by Death is a five-piece indie band from Bloomington, dating back to the year 2000. They’ve released eight full-length studio albums, the most recent being The Other Shore—the inspiration for the hand-painted backdrop (complete with a galactic starscape made from multi-colored Christmas lights) and most of their merch. Their sound was quite versatile, but with a consistent undercurrent of Johnny Cash. Imagine the Man in Black had fathered illegitimate kids with the band Horse Feathers, The Band Perry, Dropkick Murphys, and Trans-Siberian Orchestra… Murder by Death is the product of these love-children. They opened the set with one of their biggest hits, “Alas,” employing a very “Devil Went Down to Georgia” sounding fiddle. As I made my way through the crowd, I saw a guy with a jean jacket sold by one of my favorite illustrators (Matt Bailey, London, UK — @baileyillustration on Instagram). Not really relevant to anything discussed here, but pretty rare and definitely very cool. This was a pretty cheeky intro for some seriously dark songs that the crowd (myself included) enjoyed thoroughly. The song about “terrible, terrible memories” was “Last Night on Earth”, another crowd favorite. Next, they played “True Dark”, one of their most well-known recordings. Their live rendition was refreshingly different from the studio version; they played it with a bit of swing, with a haunting, gothic string section as Sarah Balliet sawed frantically at her cello. A splash of trumpet provided by multi-instrumentalist David Fountain provided a nice texture, rounding out the sound and nailing the somber country-rock vibe they presumably hoped to achieve. All in all, it was a relatively tame, well-organized show—the furthest anyone moved was to change instruments between songs. The set list was thoughtfully constructed, and the levels were perfectly mixed. The band had a predictably mind-blowing performance, proving to me and everyone else in attendance that they have well earned their reputation as Indie rock big-leaguers.